Happy 3 months of blogging to me! I never liked using "anniversary" for anything other than years. Monthiversary, 3 month anniversary, don't like 'em. I suppose Monthiversary is better, technically, than a 3 month anniversary, but still... blech. I don't want to go to bed! It's not even 8 o'clock! It's not fair, I never get to do anything fun! It's been a fun 3 months and I've enjoyed getting to know you out there and letting you get to know me. If the contest entries are any indication, then more people can't post comments on my blog than can. While frustrating, I find this comforting as well. The Yarn Harlot celebrated her 2nd anniversary (in the legitimate sense of the word) yesterday and said she wouldn't write if no one were listening. Same goes for me. She writes to connect to a community, to not feel alone. Why do I write? Some of the same reasons. 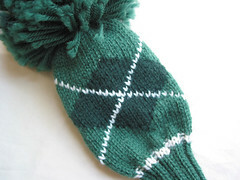 I've mentioned before, I think, that I've been knitting pretty much on my own for 25 years. I've had to come up with my own solutions, figure things out in the quiet of my mind, revel alone in my accomplishments and mourn my unfixable messes. * When I started reading blogs, I found so much inspiration: solutions, ideas, patterns I had never heard of, people who loved knitting, who knit in public places and didn't feel (or look) like premature grandparents creaking in rockers. Like minded creators. I learned so much from bloggers, and wanted to share my projects, to perhaps inspire someone, or at the least, amuse. At the same time, it was an opportunity to write. When I was a kid I wanted to be a writer. I forgot that dream through high school and into college, until I took a class on the personal essay. Loved the course, loved the instructor, but as the semester wore on, I stopped writing. Couldn't do it. Serious Blockage. I had a lot going on back then, including issues revealing me. Kinda problematic when you're writing a personal essay, eh? I later took a playwriting course, same problem. Even transferred to 3rd person characters, I couldn't figure out what I was trying to say. I couldn't write the heart of the scene. I've been a journal writer on and off (currently off). I have books on writing that I no longer think to peruse. I stopped self-flagellation years ago. When it comes down to it, a writer writes. I wasn't doing that before, but I am now. I write. I blog. I knit. I get up an extra 10-15 minutes earlier in the mornings to try for a half-decent sunlit photo. If you know anything about me, that's shocking. And I do it for all the reasons mentioned above. Plus one. To connect. Make some knitterly and spinnerly friends. I'm not very practiced at making new friends, so bear with me here. I don't always know what to say or do. But, thank you for stopping by, occasionally or daily, and for taking the time to say hello, comment on a project, idea, crazy trapeze expedition, uncontainable wheel ordering excitement. I am sorry that my current setup doesn't allow some people to post comments and hope to remedy that in the future. But I do feel better knowing that there are some out there that would if they could. * I did have supportive friends and family; just no one who really "got it". You know what I mean. This contest was so much fun, I'm sure to have more in the future. Catherine with her enchanting story; I loved the image of needles sprouting arms and legs and faces! I've never had a story written about me, thank you Catherine! Knit_TGZ's entry in the comments. The sense of what you wrote is right on, esp the last sentence, and doing things differently than the norm. 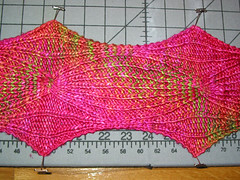 My original title for this blog was "I'm Knitting With Only One Needle" from Queen but it was taken. "Hmmm. Reminds me of that old saying that someone who could not dance had ""two left feet"". But since you can obviously knit there has to be something more to it all. That brings me to this... If there were only two needles left in the world what would you do? 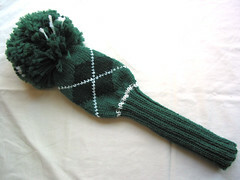 Knit you silly people, knit!" Of course, now I'm imagining those last 2 needles sprouting arms and legs and faces and procreating to bring knitterly joy back into the world. Please choose between these and the ones posted yesterday and email [mygomi at gmail dot com] your top 4 choices plus mailing address. Top winners will have first dibs, and so on. Next Wed will be 3 months that I've been blogging and I plan to celebrate! Yup, you guessed it, contest time. 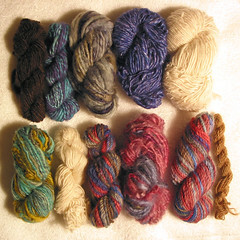 I don't have the exact prize picked out yet, but if you've been reading for any amount of time you probably noticed I use a lot of yarns handdyed by Danette Taylor. So, the prize will be some of her yarn! In the comments, tell me why you think my blog is named "Two Left Needles". The winner will be the most creative / entertaining / mark-hitting entry, as decided by moi. All entries received by midnight on 1/24 will be considered. If there are enough entries I will also draw one at random for a second prize. For those that can't leave a comment (some IE users have problems), send an email to mygomi [at] gmail [.] com with subject "2LN Contest". That small ball of yarn is all I have left, save a few yards. It doesn't look like enough, but I was sure I would run out on the front and back, too; it goes a looong way. It's very soft to knit with and that doesn't get old. 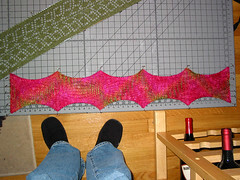 I haven't had any problems, though multiple froggings in the very beginning did fuzz up the yarn. 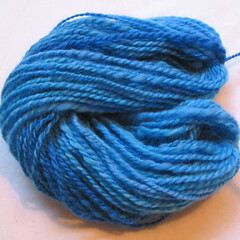 As a merino singles I know it is prone to pilling, but for the softness, I think it's worth it. 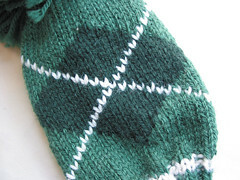 Looking at the knitted fabric I definitely want to block it both to smooth out the look of the stitches and to make it behave (ie, lie flat). 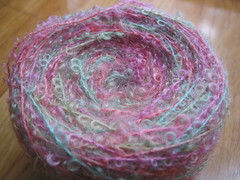 That's the food coloring dyed merino plied up. 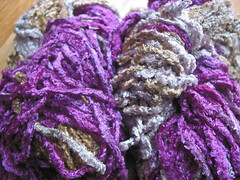 The feel of my handspun is so different from commercial yarns, more bounce and body. I haven't knit with much of it so I don't know how that translates in the knitting. 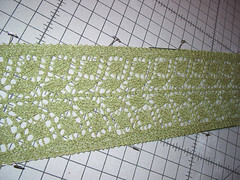 Tomorrow I have a bunch of knitting photos from Maria, a former co-worker and friend that I taught to knit. She has been a knitting fiend, finishing scarves left and right. Go Maria! Wheee, thanks, Celia! I agree, need some more spinning going on. By the way, I like your WIP icons. Congrats on your 150 posts! 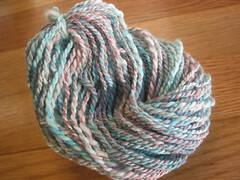 Last night I spun some more Fleece Artist Blue Faced Leicester. Had to fluff it up a good bit, and even then, it didn't draft nicely. Felt like I had forgotten how to do it. I wasn't too concerned, took the opportunity to try different drafting methods to see if I could find a way to make it work. Had fun experimenting. Wound on my yarn winder and then used the ends to ply. Had a good bit of trouble until I remembered that Heidi told me to put an end over each shoulder. Brilliant! Still had troubles, and at one point thought, "shoulder shmoulder, I'll just keep an end on each side of my waist". Hah. Didn't work at all. I like the colors, sometimes barber pole, sometimes solid. 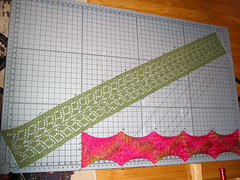 Will try to stretch the roving lengthwise on the second half, see if that helps with the drafting. 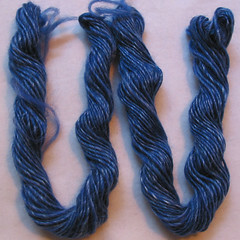 I wound what I had spun of the blue merino/silk. It (gasp) broke while I was winding around my trusty shoebox. Right around where I ended the first sitting and picked up on the second. Hehe, will have to be more careful next time I spin after a break. It's so soft and purty. On a side note, I think I've been using a lot of exclamations in my posts. That will stop. No more sounding like a giddy knitter who just started a blog. Man that's uncool. Haha. Tough beans. 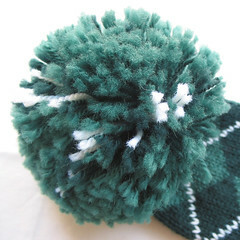 I AM a giddy knitter who just started a blog! Muahahahahaha! That's from "Cats". Okay, probably more info than I wanted to share on my first post... I used to listen to that CD over and over again and again. And I still don't know more than... 25% of the lyrics... and that's probably being generous. Not sure where my CD's are these days, haven't opened that particular box since moving into the house, since there's no place to put them. Ahh, well, one of these days. Maybe now I'm unemployed I'll get some shelves put up. I spent the better part of the last 24 or 48 hours trying to set up my website with DNN 3.1.1 and CS 1.1 and getting them to play nice together just did not work. So, for now, they share the same database and live as virtual directories under the same domain name, and we'll call it a day. One of these days one or the other will finally figure out how to integrate with the other and the rest of us (whoever we are) will be very happy indeed. Until then... enh, what are you gonna do? From top, L-R (this is the order they were made): Brown Coopworth single; some blue and teal wool that I tried to combine while drafting, also a single; awesome bulky locks single; I think merino/silk blend single; white Coopworth single; greens/blues/yellow wool, single; more white Coopworth single (much smaller skein, I was getting bored); Fleece Artist dyed blue face leicester navajo plied (my first plying! 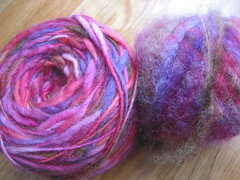 ); more fun locks single; more Fleece Artist BFL navajo plied; a bit of camel 2 ply (my first 2 ply!). All of these were done in the week and half after I learned, and while honeymooning/vacationing in Atlantic Canada. I learned from Heidi at London-Wul just outside Moncton/Dieppe in New Brunswick, and not only did I have an excellent teacher, I just picked it up like breathing. Well, a little forced breathing there at first. I am truly addicted and can't wait to get a wheel! More pics and details will follow. 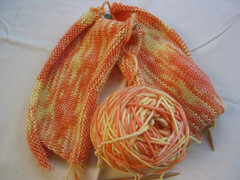 and my version of Balloon Scarf from Interweave Knits' Scarf Style. Like my slippered feet? Haven't figured out how I will post project info yet. Geez, I'm being overambitious adding photos in my first post. But I've got tons of photos from the last couple of months and I've been thinking about starting a blog for ... a long time. All in good time, though, all in good time.